These Sandstones ( SAGAR BLACK, VINDHYAN GREY, VINDHYAN YELLOW, VINDHYAN MINT ) are very rarely available natural stone of very sound engineering, physical and chemical properties and most suitable for all type of construction activities. Due to its excellent color it is most ideal for Wall cladding, flooring, garden furniture, handicraft and other purposes of landscaping as well as structural purpose. High compressive, flexural strength, negligible porosity, very low water absorption, quite good hardness, high resistance to fire, weathering, repeated cycle of freezing and thawing make it Most Suitable for Industrial & residential construction activities in extreme climatic conditions too. Quality :There is natural colour variation. Sandstone blocks are masses of stones, which are extracted from stone quarries. They usually have volume between 8-20 cubic feet. They are molded and carved to build statues and monuments, which are incomparable in their beauty and finishing. 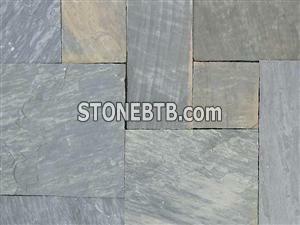 Blocks also produce stone slabs and tiles. tiles 60x30x1,5 cm tiles 150x40x2 cm tiles 150x40x3 cm tiles 150x40x4 cm tiles 150x40x5 cm max.